Advantages: Interesting subject, very good detail, cleanly moulded parts, decals in perfect register with thin and minimal carrier film. Conclusion: This is an excellent concept that allows an accurate and very well detailed Camel to be built straight from the box. Assembly is not difficult, and thanks to the clever engineering of the product, the release should easily live up to its name. If you are suffering the effects of a modelling slump, a “Weekend kit” could be just the cure you’re looking for. Sometimes when confronted with extra goodies, the pressure to create even more detail can be overwhelming. Well…for a budget price, the purchaser can now get a Camel that still has plenty of detail and can be built easily straight from the box. There is quite a bit of plastic in this release though much of it is for other variants. 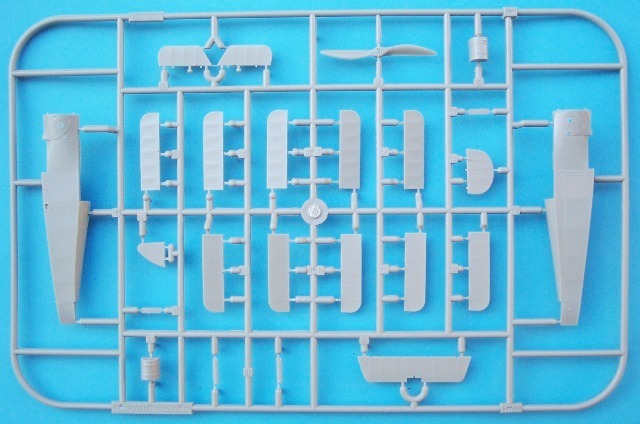 The kit reveals 5 sprues of plastic which make up a total of 90 parts. 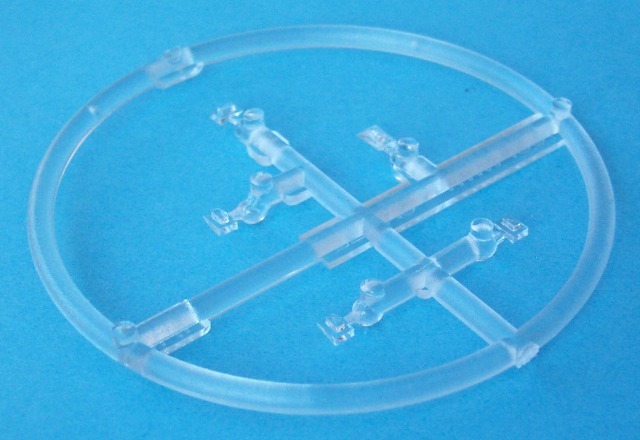 One of these is clear and the items on it are used as inserts in the wing to replicate the Cellon pulley inspection panels. This is a nice touch. The major components were compared to general arrangement drawings found in Albatros Production’s Datafile series. As expected, the outlines faithfully matched these plans so the modeler is off to a good start. The detail is also first rate with each part being crisply moulded with no distortion or sink marks visible on the finished product. There are plenty of items to fill the cockpit. Apart from the usual control column, rudder bar, seat, etc, we have the inclusion of both a main and auxiliary fuel tank. Also present is a multipart instrument panel which is further enhanced with dial faces from the excellent decal sheet. The latter is also employed to replicate the pattern seen on the wicker seat. Due to the nature of weekend kits, the modeler will have to fashion their own seatbelts. Both tape and foil can be used for this or the builder can purchase a set of pre painted etched metal items that are available separately. To complete the effect of a very busy looking “office”, the fuselage interior contains a moulded on representation of the wooden lattice arrangement. On the exterior we find some very nice stitching as well as the subtle features that result from fabric being stretched over a wooden frame. Both wings are one piece affairs which makes assembly a breeze. 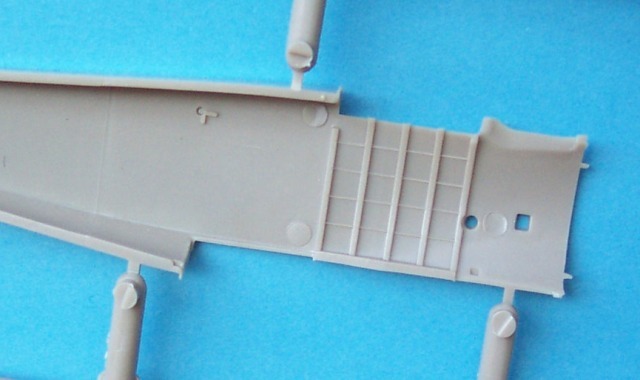 The inclusion of the upper wing cutout as part of the arrangement is testimony to the skill of the manufacturer. The rib tapes may appear over stated to the purist but under a coat or two of paint they can be made to look fine. 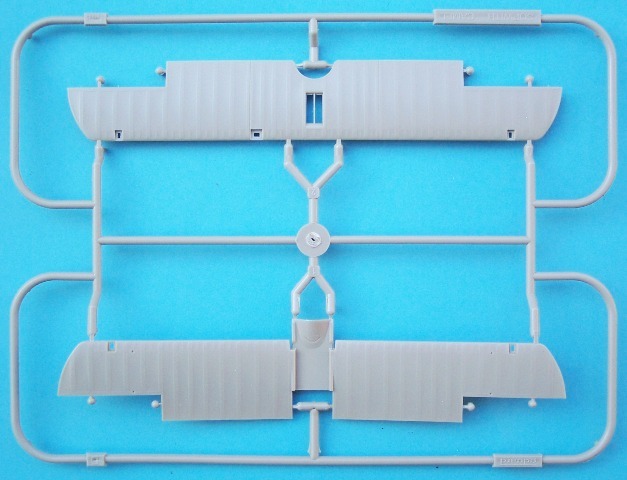 The ailerons, elevators and rudder are all separate parts which are very welcome on a kit like the Camel. Another bonus is that the control horns are cleverly moulded as part of the latter items. This allows for perfect alignment and excellent strength. The engine is made up of four pieces and comes with an oil tank and some clever channeling that’s associated with the firewall. 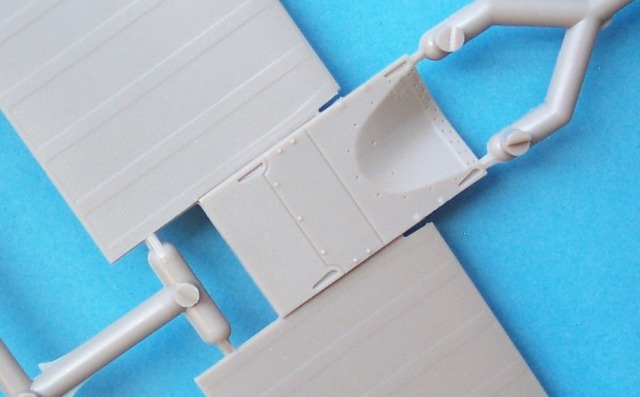 Everything fits together very well but do take care when attaching the upper wing. A previous build of the “Profi-pack” version indicated that the struts need careful attention for maximum results. 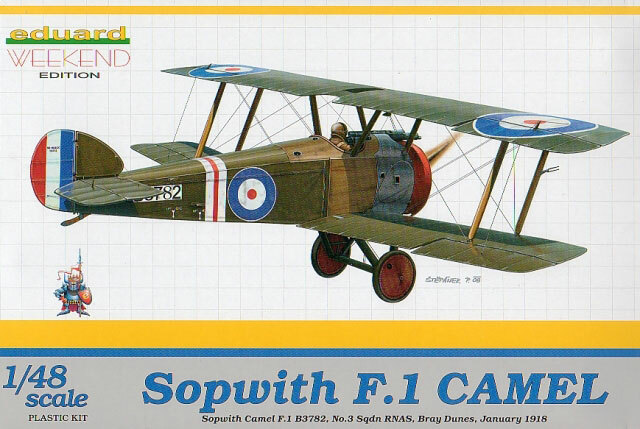 A single option is provided as befits this type of release and comes in the form of Sopwith Camel F.1 B3782. It was part of No. 3 Squadron RNAS and had been flown by Captain J A Glen and Major L S Breadner. 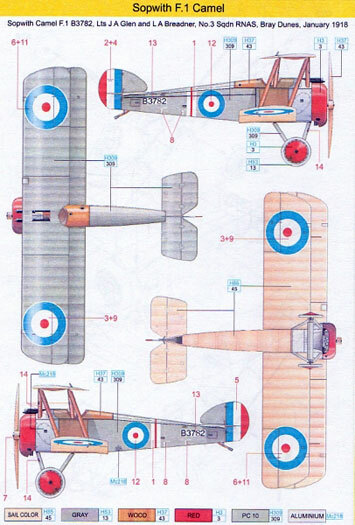 The aircraft was quite a famous one in that it was involved in 4 victories, one by the former and three by the latter. The decal sheet is superbly printed with all items in perfect register and exhibiting thin carrier film. 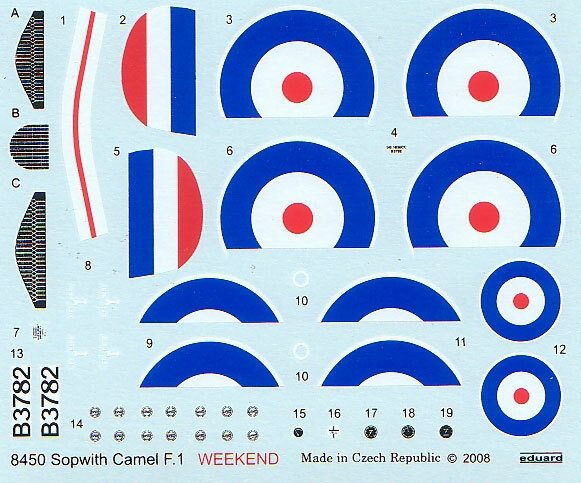 The roundels are conveniently split in two to account for the separate ailerons and this makes for easy application. The “Weekend” kits are a great idea from Eduard. As the name implies, they give the purchaser an opportunity to build a subject quickly and with a minimum of fuss. All of the essential parts are catered for and importantly the outline of these components accord well with published references. This is another fine release in the series and the varied number of markings allows for many more to come.